Inquiries like this are quite common, since the intended functioning of a viscous coupling often could not be experienced. Today we try to find an answer to this question based on statistics of our used VC stock. Hard VCs feel completely normal during cold start and do not differ from a “healthy” VC during this phase. Once the engine has reached its operating temperature, the viscous coupling begins to lock as it already reaches the range of hump temperature. This is often noticeable after a long passage on the highway, where the Syncro binds in the first narrow turn. The cause of a hard VC lies in the oil suction, which reduces the hump temperature with every drop of gear oil. Nearly a quarter of our faulty VCs are in this stage. 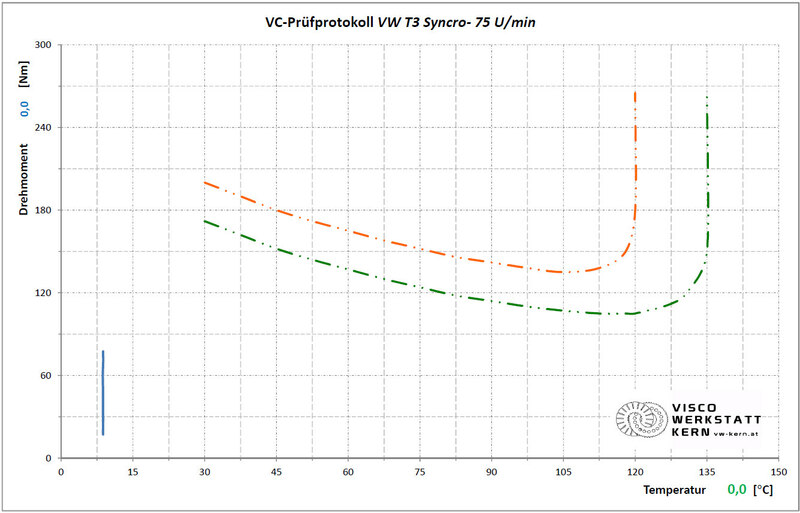 An extremely hard VC comes directly into hump-mode during the run-up of the test bench. 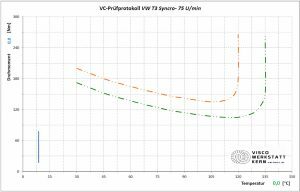 When driving it may take a little longer (because of the lower differential speeds) until the VC locks up. 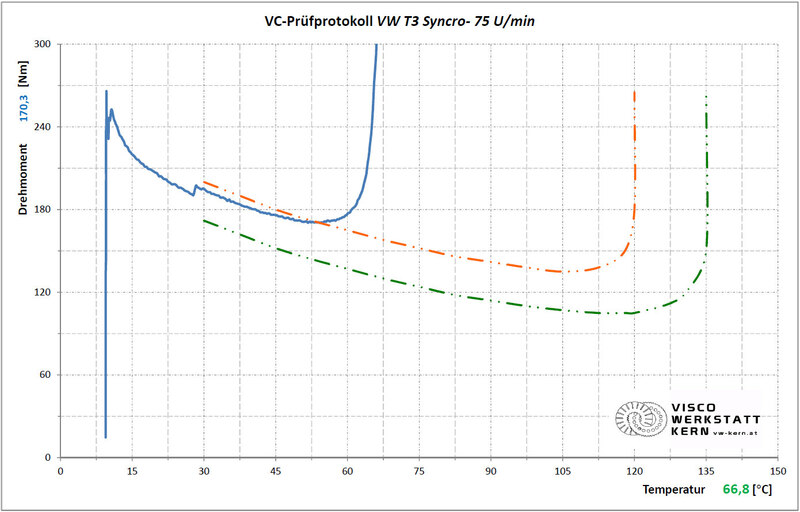 Nevertheless, it can be assumed that the VC locks permanently at room temperature and the VC is constantly exposed to hump pressure (>10bar). Such VCs provide black lines on tarmac as soon as tight bends are driven or the engine dies. The majority of our faulty VCs are extremely hardened. Due to the constant hump pressure, which usually occurs only for short periode, causes the rubber of the X-rings to creep and slowly be pushed into the gap of the lubrication holes. As a result, the X-ring can no longer create a seal as it gets “planed off” successively. 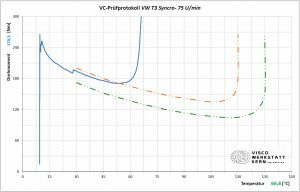 As a result the silicone oil gets washed out slowly by the thinner oil of the gearbox and the VC loses its effect to a minimum remaining moment. Since a leaked VC is usually noticed only when you need the all-wheel drive urgently, just a third of our old VCs are in this state. The order of that sequence is not random, because we think that the normal “VC-Life” in the T3 Syncro follows these 3 stages, starting with the hardening. In addition, we are convinced that we have found an effective cure for the oil suction problem with the special valve. 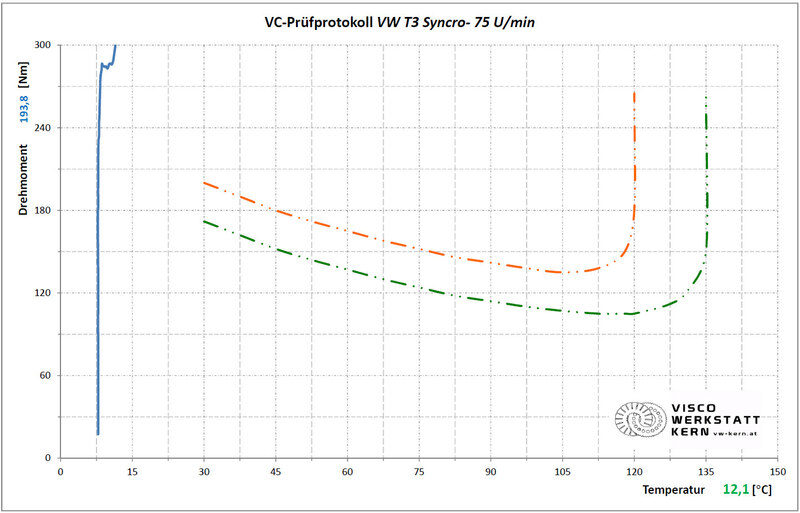 But back to the initial question: Can the VC of my T3 Syncro still work after 300km? Yes it can, but not very likely! Because only 4 % of our old VCs still reach a characteristic that matches (approximately) the manufacturer’s specifications among those VCs that we have bought on the market (in unknown condition) and VCs from customers. Old VCs that show “healthy” on our test stand, go back to sender, since we have no reason to believe that they will quit their service soon. If there are any uncertainties regarding the condition of your own Viscous Coupling, we recommend to test it on the brake test bench as a first assessment. At idling speed in first gear, the Syncro must remain in the brake tester and the engine must not go out. If it does, the VC is extremely hard. With the first bang on the accelerator (RPM 2-3000), the Syncro should be pulled out of the brake test bench via the front axle. If the bus does not come out of the brake tester at all, then the VC is most likely failed open. After removing the VC from the front differential we can put it on our test stand for detailed evaluation. Testing of old VCs in unknown condition on our test stand is free of charge.